Electronic Kit School. - There are many electronic circuit that designed to result the best light with powered by solar now. 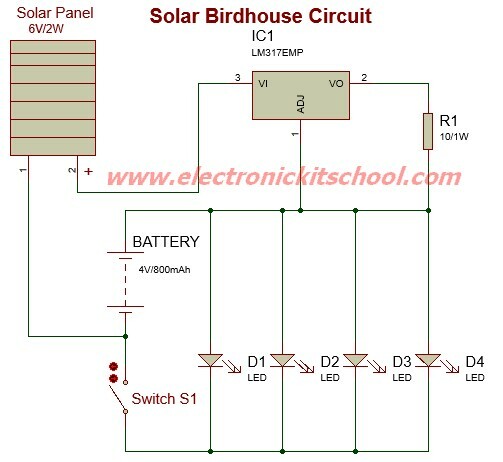 One circuit that can produce solar powered birdhouse light is shown look like in Figure 1 below. With the main or major component used are solar panel, LM317 IC and LEDs, this circuit is very simply because only need few component as needed. And now you can build this circuit in real condition easily. Circuit like in Figure 1 above show you about the Solar Powered Birdhouse Light Circuit using LM317 IC. From Electroschematics site that this solar birdhouse light is an economical circuit of a mini solar lighting system circuit is presented here. At the heart of the circuit is a mini 6V/2W solar panel. Here, this solar panel is used to charge a 4V/800mAh rechargeable battery through a charge current limiter circuit built around an adjustable 3-pin regulator LM317T (IC1).